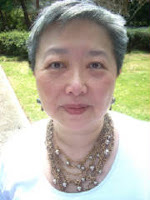 Lucy Ke, president of KeFactors, was recently a guest blogger on Sales Is Not For Sissies. Her posts and insight led me to ask Lucy if she would be willing to blog for us on a weekly basis. Starting next week, Lucy will be blogging on a variety of different subjects in a series we are calling KeFactors Fridays. If you have any questions for Lucy or any particular topics you'd like her to cover, please e-mail her at LucyKe@Kefactors.com.